Google Search Is Now Google Instant: Now Search Before You Type! "Google Instant isn't search as you type, it's search before you type." 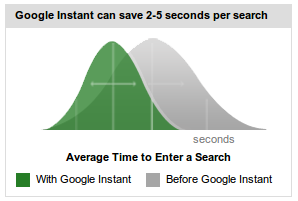 Lets you search faster: It has been proved on paper and by experiments at Google that by predicting your search and showing results before you finish typing, Google Instant can save you 2-5 seconds per search. Smarter Predictions: As shown in the image above, Google Instant not only shows you real-time search results but also shows you real-time keyword suggestions. Instant Results, faster than never before: Till now, you had to type a full search term, hit return in order to get the right search results. But Google Instant has changed that all. Now you can see search results appear instantly as you type. This eventually helps you to see what are you actually ending up searching! As of now, Google Instant are live on Google Search versions of various countries including US, UK, France, Germany, Italy, Spain and Russia. In order to access Google Instant you should have one of the following browsers: Chrome v5/6, Firefox v3, Safari v5 for Mac and Internet Explorer v8.